Learn about the temperament and personality of the Pharaoh Hound. Discover what he's like to live with, his traits and characteristics and how he generally behaves. And look at lots of Pharaoh Hound photos. 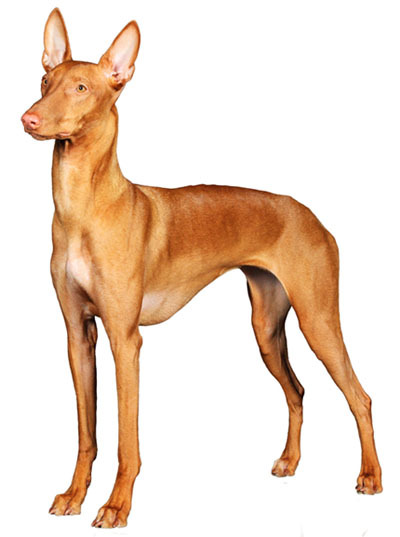 The Pharaoh Hound is an active, athletic, and agile hunting hound who also makes a devoted family pet. He is friendly, playful, outgoing, and affectionate with his family, though not as demonstrative as some breeds. He is aloof but peaceful with strangers. He loves children. He gets along well with other dogs and with cats, but will chase after animals that he views as prey. He is fast and unreliable on the recall, so he needs an owner with a safe, fenced yard, or a commitment to keep him on a leash. He can easily jump most fences, and he is often capable of digging underneath them. He needs stimulating daily exercise, and he can be quite boisterous. Pharaoh Hounds enjoy obedience competition, and lure-coursing. He barks a lot because he responds to distant sounds that his owners usually never hear. He can also spot bark-worthy things at what seems like miles away. These are intelligent, playful dogs that are full of mischief. They are show-offs and will do anything to please their owners. And they blush when they are happy or excited, which Pharaoh owners find pretty irresistible. The Pharaoh Hound is intelligent and quite easy to train. He learns new commands quickly at an above average rate. The Pharaoh Hound sheds a fair amount of hair. You'll find hair stuck to your couch, carpets, clothes and everything else in your home.